Our public transportation systems are on the verge of big change, but whose? This spring Portland saw government transportation agencies, workers unions, riders advocates, and rival taxi companies all scrap and struggle for their stake in the game. The stark realities of these fights were laid bare in February when Trimet General Manager Neil McFarlane warned that by 2025 Trimet could cut service by 70% and eliminate 63 bus lines. Coming just months after Trimet implemented fare hikes of $8.7 million and service cuts for the fifth time in four years, the implied threat to the drivers of the Amalgamated Transit Union and the riders they served was all too clear. A revived push for transit justice is needed, now. The everyday operations of public transportation deeply affect the lives of millions in cities around the world, from the driver working 12+ hour days, to the rider who relies on long bus commutes to meet their basic needs, to the neighbor who faces dislocation to eminent domain and land-use changes. And yet in both government and privately-owned transit systems these people are routinely disenfranchised of any substantive say in what affects them. A classic example is Trimet, headed by an unelected board of directors appointed by the governor, many of whom do not use transit regularly, and none of whom are transit-dependent. Further down the chain is management team that consists of several dozen $100-$200k salary positions, more focused on PR propaganda than responsiveness to the community. Against this backdrop the need for direct democracy and worker-rider control is clear. Only through organizing workers across the industry and riders throughout the community can we begin to build systems that emphasize function, empowerment and plain old common sense. 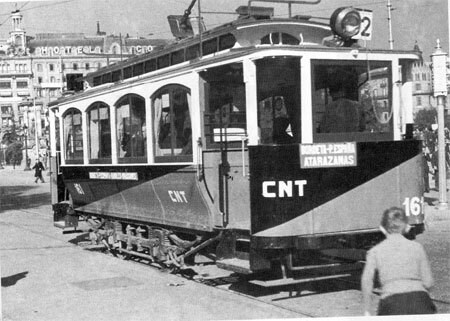 Perhaps the most far-reaching demonstration of such organizing was the collectivization of buses, streetcars, and subways by revolutionary Barcelona’s CNT union in 1936. Over 6,500 workers from six private companies expropriated the city’s transportation system, managing the operations through workers assemblies, and serving over 200 million passengers a year. Freed from the hierarchy and profit-motives of the bosses, working conditions and benefits improved, long-standing technical inefficiencies were remedied, service was expanded, and fares equalized. Some of the most iconic civil rights struggles have taken place fighting for a seat on the trains and buses of history. While Homer Plessy’s pushback against segregated railcars couldn’t overturn the racist laws of 1890’s America, Rosa Parks’ act of disobedience became a symbol of the thousands of actions rejecting racial apartheid during the civil rights era. In the 1980’s militant disability rights groups like ADAPT also put their bodies on the line, blocking inaccessible public and private buses with wheelchairs and crawling up the steps in order to call attention to the exclusivity of lift-less buses. Sadly, for all the work done to open up transit to all people, our public transit system is increasingly a site of continued oppression. As wealthier and privileged Americans transitioned to driving personal cars (and now biking), utilizing the bus or MAX is stigmatized for the race, class, mental and physical abilities of other riders. Whether said onboard or merely sneered outside, the slurs about riders not only attack their human dignity, but the decades of struggle against oppression and segregation. The goal of creating safe and inclusive spaces on public transit has not ended. Recent feminist campaigns have called out the constant street harassment women, sexual minorities, and others face riding on buses and trains. The complicity of bystanders who ignore such behavior has opened a space for police and goon squad security guards to impose themselves as the solution, rather than a anti-oppressive community-driven responses. With these armed thugs comes the violent criminalization of immigrants, people of color, youth, and the poor they uphold. Fare checks on MAX trains provide a convenient excuse for police to detain undocumented immigrants and begin the deportation proceedings that have destroyed so many families. Law enforcement’s tendency for deadly escalation in encounters with riders they don’t like has made headlines with the tasing of Calbruce Jamal Green, a man with developmental disabilities accidentally waiting for a ride on an out-of-service Trimet bus, and the New Years Eve shooting death of Oscar Grant by BART cops as he lay handcuffed and unarmed. As the national activist network INCITE! Women of Color Against Violence notes, we must mobilize against both the internal violence in our communities, and the external violence the police and State direct at our communities. As transit fares sharply escalate with austerity, a huge barrier to accessibility has simply been affordability. One of the most innovative pushbacks against this has risen up in Sweden and Norway, where the Anarcho-Syndicalist Youth Federation has started the Planka.nu campaign. Promoting tax-financed zero-fare public transportation, the campaign supports fare-dodging with an insurance pool to help fare-free riders pay any fines they may incur. The campaign has made the astute point that in capitalist society transportation is a human and economic necessity, and if corporations need workers and customers to travel to their factories and stores to run the economy then they can pay for it. The social and environmental benefits of this approach have begun to be recognized by even mainstream political forces, with municipalities in Europe and around the world offering free public transportation to their citizenries. Earlier this year Tallinn, the capital of Estonia, began offering transit at no cost to its population of 400,000. While Portland fancies itself a leader in progressive planning and green transportation, a quick glance around shows we are moving backwards, not leading the pack. For Portland’s politicians and planners, the capstone of our public transportation system has always been rail, whether the MAX lightrail reaching out to the suburbs or the streetcars winding through downtown. But while these expensive and grandiose routes serve real estate developers and Charlie “Choo Choo” Hales quite well, they are inadequate to serve those low-income communities whose homes and daily needs revolve around the periphery, rather than the downtown core of a rapidly gentrifying city. True to their name these “capital projects” have done more to meet capitalist interests in controlled redevelopment, big contracts for technology and infrastructure firms, and bright shiny projects for political resumes and higher-income riders. Cheaper and more flexible options that could meet the needs of a shifting working class, such as bus rapid transit, share taxis, and van-shares, remain unutilized in Portland. Meanwhile, embarrassments of hubris and greed like the WES commuter rail and Eastside streetcar run close to empty. Portland’s pushback against these projects has been small and uninspiring, where direct action could push the issue before the whole community. Infrastructure protests, such as the Stuttgart 21 high-speed rail project in Germany or the anti-airport ZAD (Zone À Défendre) camps, have not only impeded capitalist redevelopment but also fostered wider conversations about space, corporate control, and direct democracy. Perhaps the most important takeaway for transit activists is a recent one. For years the Moviemento Passe Livre has pushed for free public transit fares in Brazil, but this June the protests exploded exponentially. A 20 cent increase in bus fares in Sao Paulo sparked large militant protests, that not only block transit, but went on the attack against the police and symbols of the state and capitalist system. The cycle of repression and ever more expansive protests quickly swept across the country and caught global headlines. The demands of the hundreds of thousands of people in the streets grew well beyond the fare hike, and protesters began targeting the State’s violence against the poor; the corruption and profiteering behind the World Cup and 2016 Olympic developments; conversion therapies for queers; and global capitalism. Between the abounding reformist demands and the insurrectionary attacks the authorities were quick to reverse fare increases and make commitments to increased social spending. The movement made more gains in a few weeks than it had in years, all by expanding their demands to what seemed impossible, and inspiring wide cross-sections of the populace in the process. As other activists have said before, the goal should not be to win one campaign or policy adjustment, but to leverage that issue to get whole communities rising up and struggling together against the oppressions they face. By setting our sights high, we may be surprised by what we achieve. « Right 2 Dream Too: A New Hope?